George McAuliffe in Not All Cops Are Bad. Photo by Ryan Coil. 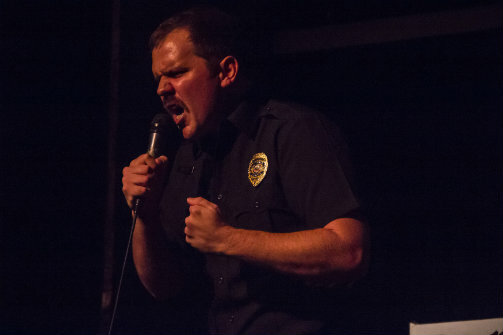 BOTTOM LINE: Not All Cops Are Bad, a satirical solo commentary written and performed by George McAuliffe, presents a hilarious, absurdist take on police brutality and activism, featuring multimedia effects and audience participation. Officer Scott Baker is one of the good guys, or at least, that’s what he wants us to think. But unlike a film noir crooked cop with a dirty trick up his sleeve, Officer Baker really is genuinely interested in winning the hearts and minds of the people…while doing a little damage control. After the recent series of damning videos showing police brutality, racism, and lack of compassion, Officer Baker—a self-proclaimed patriot, having joined the force after September 11th due to youthful enthusiasm—has taken it upon himself to be our guide “Beyond the Badge.” Through a multimedia (read: PowerPoint heavy) presentation featuring audience participation and a heck of a lot of 7-11 Big Gulp, Officer Baker makes the case that cops ain’t all bad. That’s what’s compelling about Not All Cops Are Bad, written and performed by the thoughtful, audacious George McAuliffe. Officer Scott Baker isn’t all-bad, even though he is crude, a bit rough around the edges, and generally laughable. Instead, McAuliffe creates a complete human with good intentions and a sympathetic, though absurd, backstory. The warts-and-all (or better yet, mustache-and-all) portrait he paints goes a long way towards disarming the audience, allowing for moments of genuine introspection. These are most palpable when Officer Baker shows the audience videos, including real footage of a police beating and a racist musical parody, evoking uncomfortable laughs in the audience that McAuliffe expertly builds upon by bringing the house lights up and posing for social media selfies, suggesting the hashtags #HugACop and #MeSoSorry. It is somewhat unfortunate, then, when the humor occasionally veers toward the mean, particularly a recurring and somewhat gratuitous joke about the Officer’s overweight wife. It is clear that McAuliffe is aiming for shock value, pushing the humor with razor-sharp timing to a manic frenzy through repetition, building towards one particularly outrageous climactic fantasy about his wife, featuring an airlift, the moon, and opera. As satirical commentaries go, this one is closer to a live action Christopher Guest movie than a George Orwell story, leaning heavily on a certain absurdist yet earnest humor. McAuliffe, an experienced Chicago improviser out of the legendary iO theater, cites Louis CK, Bob Odenkirk, and Norm Macdonald as comedy idols. Not All Cops Are Bad deals in exactly their kind of exploration of the grey zone of morality. In the present moment of Black Lives Matter protests, a Trump presidential candidacy, and social media activism, McAuliffe genuinely provokes the audience to consider the many facets of the issues, including over-taxed cops, Internet outrage, and the universal need for validation. Not All Cops Are Bad is written and performed by George McAuliffe. Direction assistance from Ashleigh Hairston, Tim Baltz, Ben Seeder, and Mike Canale.